Just below Morne Bruce about 200ft from the banks of Roseau River lies approximately 40 acres of land cultivated with a variety of plants, shrubs and various species of fauna. This superior natural arena once existed as a large sugar cane plantation. In 1889 it was developed twofold with an economic and an ornamental section to what is known today as the Dominica Botanical Gardens. The economic section grew crops like citrus, sugarcane and avocado to sell to major plantations in Dominica, and in 1890 the ornamental section was established with over 500 species of trees and shrubs from tropical world. “Gardens” as it’s locally called was once the most prominent Botanic Garden in the Caribbean, until it was destroyed by the wrath of Hurricane David on August 20th 1979. The Botanical Garden falls under the jurisdiction of National Parks of Forestry and Wildlife Division. Persons can be fined for hunting wildlife or destroying any plant in the park. It also one of the main tourist attraction on island and is usually swamped with excursionists when there is a cruise ship on port. The gardens serve as both a recreational and educational ground for many visitors and residents. A few distinguishing features of the gardens include Jacks Walk Step, Parrot Aviary, Bamboo House, the cricket ground and garden path. Several persons stroll on the 35step climb up Jacks Walk which they deem to be romantically welcoming. Its’ composition is what make it so exquisite. The Shrubs are the most attractive feature of the Botanic Gardens due to its colorful appearance. However, Flora and Fauna still remain the main features of the gardens. There are 70 species of Trees the Fiji fan palm (Pritchardia pacifica) being the tallest tree. One cannot comprehend the voluminous species of fauna that can be found in the Gardens; Birds, Mammals, Reptiles and a few invertebrates like insects and spiders’. There are at least 36 species of birds including the Broad-winged Hawk called “Malfini” locally, Green-throated and Purple-throated Hummingbirds and Tropical Mockingbird. The National Bird “the Sisserou Parrot” and Jaco Parrot are housed privately at the Parrot Conservation and Research Centre. They are not available to the public since that is not their natural habitat and the Sisserou Parrot is an endangered species. On a typical day in the Gardens one might come across mammals like opossum and bats, or a few of the six (6) species of lizards such as the Dominican Ground Lizard and Dominican Tree Lizard which are endemic to Dominica. Occasionally a few snakes like the Boa Constrictor “Tete Chien” and the black and white grass snake “Kouwes jenga/Koulev” may be seen. Note that our snakes are not poisonous and are merely harmless. Butterflies and Moths fulfill their place in the eco-system and can be seen sucking off the nectar from the White Peacock and Caribbean Buckeye flowers. Invertebrates such as centipedes, spiders, millipedes and the world largest insect “Hercules Beetle” form part of the fauna but they are rarely seen. 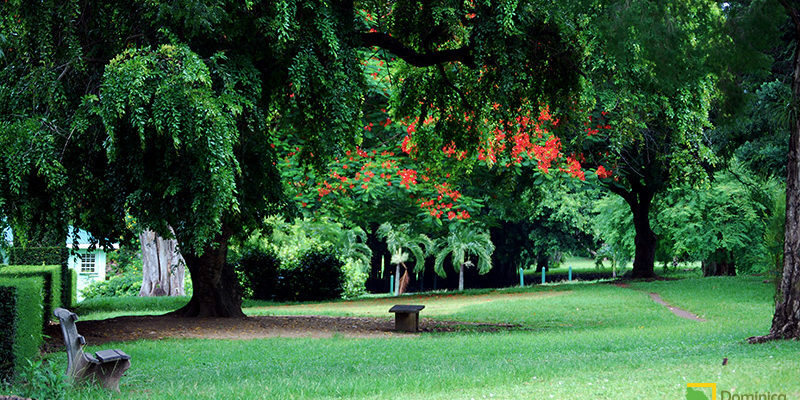 This large park is not only known as natural attraction but as source of medicinal benefits. Some plants have been documented to have medicinal uses that emanated from the African culture but are not scientifically proven. The Kalinago people used the Periwinkle (Catharanthus roseus) in tea to help diabetes. Guava leaf (Psidium guajava) is used for diarrhea and bad stomach and the orange leaf (Citrus sinenses) to stop vomiting. There are numerous plants that are used locally for medicine but not found in the Botanical Gardens. A lot of our mainstream medicine came from plants for example salicin which is the based for aspirin came from the willow bark. In terms of correct dosage and use, we cannot decipher this from using the plants themselves. The elders would know more since they believe in herbs rather than generic drugs. The Botanical Gardens still remain a place of tranquility where one can come for leisure, sporting events and educational sessions. It is equipped with gazebos and benches for picnics and the lawn is always neatly trimmed. Today, the Botanical Garden is not as fully developed as it should but, it is being upgraded to make it premier of its’ kind in the Caribbean.